The tile is sourced from natural geologic material and contains no chemical preservatives. It also is 100 percent recyclable at the end of its lifespan on the roof (approximately 75 years with little maintenance). 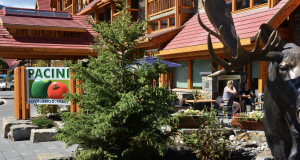 To ensure the new hotel could withstand the subarctic climate, a concrete tile roof was specified. The distinctive concrete tile was chosen for its energy efficiency, durability and aesthetic appeal. 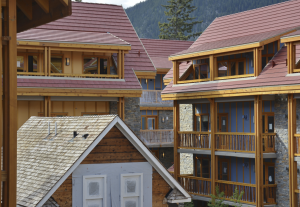 Rocky Mountain Sundeck & Roof’s crew of 12 to 15 men installed a self-adhered ice and water barrier to a plywood deck on each of the hotel buildings. For ventilation, battens were installed and finally about 60,000 square feet of concrete tile tops the hotel’s roofs. In addition, Hanson notes the courtyard, which features fire pits, swimming pools and other amenities for guests, actually is a 48,000-square-foot flat roof. The roof covers underground parking for the Moose Hotel & Suites. Hanson’s crew torch-applied the SBS modified bitumen membrane before the courtyard was meticulously landscaped. Hanson says the entire job was without difficulties. The roof tile, which shipped from California, arrived on time and undamaged. Two tower cranes onsite blocked off the street and loaded the roofing materials for the crew. Mission Red was the color chosen for the concrete tile roof. Snow Retention System: TRA Snow & Sun Inc.